Revival, as a subject, will produce a wide variety of opinions. Some Christians believe that the only thing that the world needs is revival. Others believe that revival is the same as revivalism and that Christians should avoid that which produces emotionalism. Still others suggest that since the word “revival” does not appear in the New Testament, it must be a negative practice to be avoided like the plague. Others find this previous opinion to be suspect of intellectualism and a complete avoidance of Old Testament revelation (cf. Ps. 69:32; 71:20; 85:6; Is. 57:15; Hosea 6:2; Habakkuk 3:2). There are also a great deal of Christians who believe that the popular concept of “revival” is rooted in both truth and error in that it isn’t that the Bible doesn’t teach revival but that many people misunderstand what revival looks like and produces and changes. There are other opinions, but to some degree, everyone falls into these categories. I’ve been a Christian long enough to have experienced several types of “revivals.” I’d like to share some of these with you, but I’m doing so with the hopes of encouraging others to share what their concept of revival is and to have us wrestle with what the Bible says about revival and to explore whether some of the experiences we’ve each had are supported in the Scriptures. Are some of those practices healthy? If so, let’s seek after them! If not, let’s avoid them like the plague! This is the type of revival is popular in what is generally referred to as the Pentecostal or Charismatic Movement. Not all Pentecostals and Charismatics agree with these things, but the generalization won’t be denied. In the mind of these types of Christians, revival is about experiencing the presence of God in a way that causes you to lose control of yourself. You may shake. You may fall. You may do things you’d never do, ever. Did I mention that you’d never do these things? I’ve seen people who were quiet and reserved turn into the loudest and most exuberant people in the midst of a worship gathering. These examples are just the beginning. Let’s go a little further. A preacher wraps up his sermon by offering an invitation to over 8,000 people to come forward, to the stage, to receive prayer. Thousands of people run to the front. Thousands. They are standing there, and it appears to be a wall of people. I bet you didn’t know that walls can collapse or fall, but they can. As soon as the preacher begins to put his hands on people or towards people, they start falling backwards, oblivious to what is behind them. Everyone, thousands of people, are all laying on the ground. No one appears to be bleeding from these falls, or even hurt. They are just laying there. Others say things like, “Praise God, for His presence is here!” and “The glory of God has descended!” Wow. I’m sitting there and I’m not quite sure what to think. What has happened? But the falling isn’t all. There’s more. Now it’s really getting crazy! People are starting to bark like dogs! Others are frothing at the mouth! Someone just actually threw up! Another person, wearing lots of black, has eyes rolling into the back of their head. Some teenager, apparently quite upset, was starting to cuss loudly until a person, apparently a minister, laid hands on her and prayed for her that the peace of God would come. Now she’s laying there, crying. Yeah, I could go on. Maybe you could add to this type of revival. What have you experienced or learned? I was told that this style format type dimension of revival is about God’s tangible presence. It’s about Him showing up. It’s about Him doing a work in His people. It’s about God changing people and doing things in them that you can’t explain or even, sometimes, understand. It’s messy because it’s about broken people coming into contact with an awesome and holy God that doesn’t car about the boxes you put Him in. And it’s about stuff that is weird! It’s about stuff that is novel and unheard of. But you’d better be expecting that kind of stuff, otherwise revival might not come! You need to expect the weird-supernatural-God-doesn’t-care-about-your-theology-or-doctrine type of stuff. Did I mention that God’s presence is the determining factor for this type of revival? Did I mention that there’s a difference between God’s omnipresence and His manifest presence? There is. And if you don’t understand that, then you probably won’t understand this type of revival. I’d love to hear what you think about this type of revival. The goal here is not to get into the debate of what revival is (a post for that will come soon). This is simply about this type of revival. Been in one? Loved it? Hated it? Not sure? What is your experience? 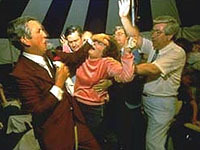 I’ll be honest, I used to be much more pentecostal than I am now in my theology, and I’ve been in gatherings like this. At one time, I would have had nothing but positive things to say regarding this particular variety of phenomena. However, as my theology has changed somewhat in recent years, and in light of the Biblical teachings regarding the Holy Spirit, I now find such behavior somewhat troubling. If the Holy Spirit has come to convict the World of sin, righteousness and judgment, how can we reconcile that with such strange phenomena as these? Is there Biblical precedent for such behaviors? In what way is God glorified in the midst of such a gathering, and what purposes do we believe God is accomplishing through these seemingly “strange” behaviors? These are all questions that we must ask, and the answers that I find make me somewhat wary of the practice of some of these behaviors. I cannot and will not say with absolute certainty that these things are not of God, but I will say that the role of Holy Spirit, who is very God, is not something to be taken lightly. I would shudder to cheapen the Holy Spirit’s work, making Him some sort of force that causes people to lose control. Again, I will not make a sweeping statement that the behaviors and phenomena listed in this post are not of God, but neither will I pursue the “manifestation” of revival rather than the God who is able to bring the human heart out of death and darkness and into life in Christ Jesus. And how do you reconcile these types of supposed “Holy Spirit induced” revival behaviors to the Bible’s repeated references to be sober in spirit? Or do I just have bad theology? For the sake of discussion, I have to say that the Bible offers several examples of “weird stuff,” so to speak. Actually, I can imagine Abraham was probably thinking that the concept of circumcision was a little crazy. As would Hosea probably have been wondering how “sober” it would be to marry a prostitute (assuming you find that to be literal). What do you think? Jesus spit and made mud and rubbed it on the eyes of a blind person. Kind of weird, if you think about it. I would cite the example of the man possessed by legion. After Christ had healed him, he was sitting clothed and in his right mind. Perhaps that was considered strange because of what the people knew this man to be. But honestly the whole shaking, falling down, I can’t honestly say I would really be comfortable in that kind of setting. The bible does say let things be done decently and in order. Revival I believe should be daily, not once or twice a year at some week long meeting where a preacher doesn’t preach to you as much as at you. The bible clearly speaks about true praise and worship as lifting hands and voices and even dancing. Perhaps doing these things more, in excess of what may be normal, could also be a form of revival. Not sure if the bible ever speaks of rolling in the aisles and shaking on the ground. Where do you draw the distinction between God’s manifested presence and what may be the manifestation of demon possession? But honestly the whole shaking, falling down, I can’t honestly say I would really be comfortable in that kind of setting. This is a great point. I can really relate to what you are saying here. I have been in a lot of “revival” type of meetings where I was amazingly uncomfortable. Sometimes I think it was for good reasons. People “barking” tends to make me uncomfortable unless they are playing cats and dogs and are little kids. Then it is okay. But other times I wonder if our comfort doesn’t get in the way. What if falling down is something that God is doing? Should our comfort level be used to measure it’s appropriateness or not? Interestingly, I’ve prayed for people before and they have fallen down. And I didn’t know what to do. I just kind of… was like… “let’s move on.” Ha ha. The bible clearly speaks about true praise and worship as lifting hands and voices and even dancing. Which bible verses are you thinking of here? Where do you draw the distinction between God’s manifested presence and what may be the manifestation of demon possession? Yeah! that’s what I want you to answer!!! Ha ha. Oh, and I’d like to include alongside God’s presence and demonic manifestations the fact that people do things themselves too (the “flesh,” as some would call it). Great points. I have lots of questions now. Hmmm. Is there a difference between God’s “manifest” presence and His normal presence that happens because He is God and everywhere? the old testmanet shows us that god’s presence is different sometimes. i think revival does include a lot of weird activity. it iz the way god shows us he is god. I have been to the Brownsville Revival several times and I have been at strong revivals at my home church in the deep south. Yes, I have “fallen out” in the Spirit a few times… I admit, the first time I did it, I kinda went out because I wanted to experience what everyone else was! (It didn’t work that time – I just laid there, waiting, and then finally got up… disappointed) But the other times I stood until I felt I just couldn’t anymore and when I went down, I could definitely feel God working on something in me. One time, it was very powerful because I had a vision of Jesus that has stayed with me until this day. I have had the laughter, once, and again, it was God working in me. I was severly depressed at this time, and had no joy at all. The outside situation was in part – working about 60 hours per week, still having no money, the first night of the revival our car quit and it would not make it back home (and no money to fix it); the partor then lent us his son’s car only for us to crack the engine block on the way to the second night of revival (because it ran out of coolant), etc. Life was far from good and I saw no way out. When I hit the floor the last night, I had the wonderful vision of Jesus being with me, and then when I “woke up” (?) I was so happy that I started to giggle, then laugh, then belly laugh with tears streaming down my face. And I felt peace and joy down deep, and I knew even if things got worse than they were, I was still going to be ok. I have shaken, not extremely, and have felt the “Holy Ghost Goose Bumps” when someone gives a word or a testimony. Of course I have been in places and have seen things that do cause me to question if they are caused by God, but I guess it really comes down to what is happening between that person and God. We as outsiders have no idea what is taking place at that moment, so in a way, it might be wrong to question it at the time it’s happening. Now if the person gets up or gets done and can’t give any type of testimony of what happened, mmm… IDK… but it would still be between God and that person regarding the reality. What I mean is the person and God have to sort that out; it’s not up to us. Anyway the revivals such as these that I have been to usually make the stipulation that you don’t have to “react” in any way to recieve what is being poured out. Most of the time, I would just sit and feel my eyes well up with tears and they would just pour down my face while I was worshipping. God touches me then, too. My concern about this kind of revival is that the gospel of repentance seems to either be made into a side item or never mentioned. The signs and wonders of the early church always authenticated the message, they were not the message by themselves. After God did something such as healing the lame man at the temple the disciples would immediately preach about sin(in a specific way such as “this Jesus who you killed”) and judgment and salvation from sin through faith in Jesus. It seems to me like a lot of people are going to these places of revival to “see the stuff” rather than because they love to hear the story of Jesus. If we get so caught up in stuff happening that we never check our doctrine or philosophy then we will be sitting ducks for the deception of the last days. It says in Revelation that the false prophet will deceive many with false signs and wonders. Well, the Psalms are full of verses that show that raising our hands and lifting our voices are ways to worship (Psalm 24, 119, and Isaiah 58). I can’t see God operating out of ways acceptable to him so therefore, revival should operate the same way. He would want us to keep a proper “Charismatic MO” with an openness to the guiding of the Holy Spirit. Besides that and clear examples in the Bible (The possessed lunatic and Paul speaking in tongues for example), there may be no other way to tell. During such times when people are manifesting uncharacteristic behavior. Although, I personally believe that God would manifest revival by Christians showing their worship in a more intense level. You have to have discretion in such matters, but don’t be judgmental. And stating that God can’t manifest himself in many ways that one may not be familiar with, because as Paul said, we don’t check doctrine or philosophy, then we become deceived and thus judgmental. But most importantly, God does not deal with revival on an individual or arbitrary level, but on a collective whole (“and will heal their land”) but God deals with our judgmental attitude on a personal level. Perhaps unity on theology for non-damnable issues should be our focus, because revival is for those who are saved and who have reached a point of needing to be or remain close to God. This should be a matter of focus on where we believe our live should be. If you’re not at the point where shaking should be taking place for you, well then God will manifest himself in other ways, whether he’s giving you goose bumps (As I have experienced, though I’m not sure if I’ve shaken or not, but it may have been a comfortable and seemingly not-threatening or demonic shake, which I have seen) or God talking in a burning bush. After all he is the “I AM” just fill in the blank for what he could be or even how he shows himself. I have an open mind and an open heart for God.